It has been interesting following the Apple Watch over the last three and a half years. From a device that seemed like it was looking for a reason to exist, the Apple Watch has now become, as Tim Cook has said, the most personal device that Apple has ever made. With steady evolution through its iterations - adding such features as GPS and LTE - the Series 4 marks the first change in the form factor of the device. You'd think that this would make a big difference in the weight of the device, but Apple has kept the increase in heft to a minimum. As an example, the 44mm aluminum GPS + cellular model weighs 36.7g compared to 34.9g for the equivalent 42mm model. Apple has accomplished this in part by using an LTPO (low-temperature polycrystalline oxide) backplane on the display, which improves battery life by 5-15%. In fact, the battery capacity on the new models is less: for the 42mm vs. 44mm models it is 1.12 watt-hours compared to 1.34 watt-hours. Nevertheless, the new watch is rated at the same 18-hour battery life. All this is to say that you won't notice much difference between the Series 4 and the Series 3 aside from the thickness. What you do get is a much larger display, capable of showing more information and presenting it with more clarity. It was never easy to read emails on the Apple Watch before, but now it is fairly easy. These new sizes bring the Apple Watch to a new dimension of usability, not just in terms of apps, but also with two new marquee watch faces. 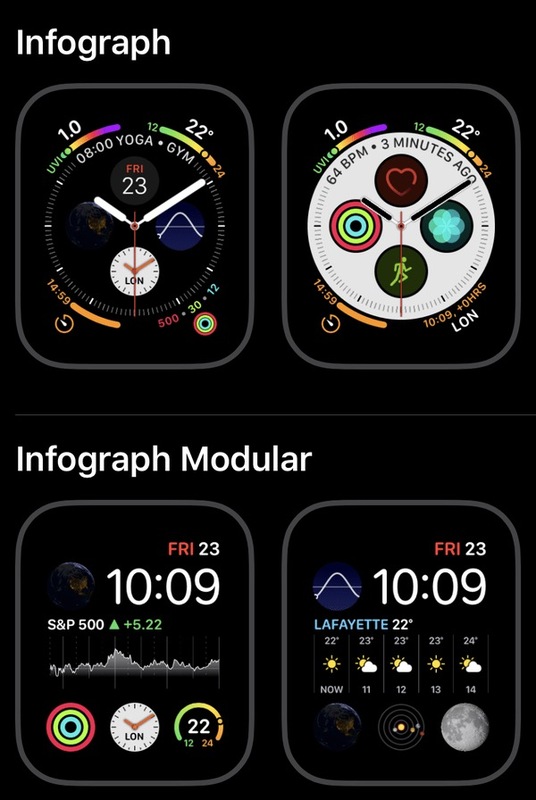 The Infograph watch faces shown above leverage the new display size. For example, the modular face offers three complications at the bottom compared to two with the previous model. They are larger with a higher resolution and offer more detail. The analog Infograph face features new curved complications on the four corners of the watch face, providing a different way of presenting information. For example, the Weather complication in the top right of both examples above shows both the current temperature and the temperature range for the day. The timer at the bottom left shows the duration as it ticks down, both in time and in a decreasing orange line. The Battery complication shows the remaining capacity both with a percentage and a line that diminishes as you use your power. However, some of the more useful complications - such as Phone, Messages, Home, etc. - aren't available for these faces. When Apple released the first Apple Watch, the company explained the triad of key features: it was a timepiece, a communication device, and a health and fitness companion. 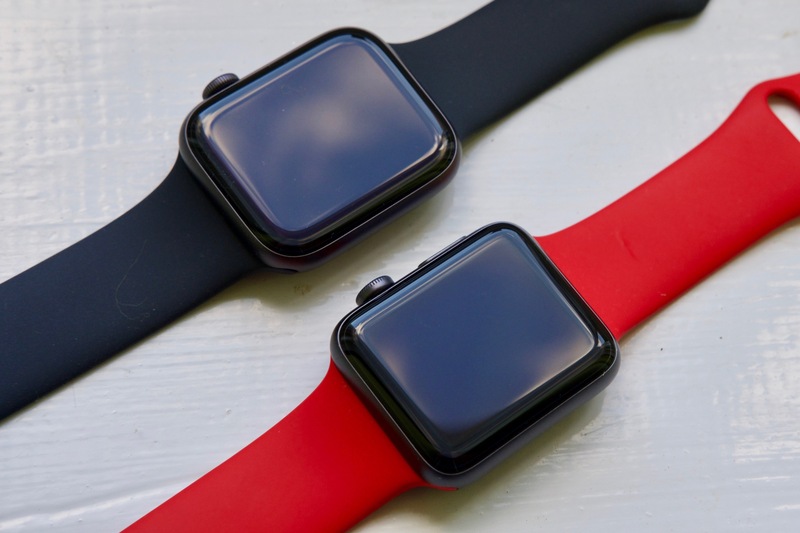 Now, Apple is touting the watch as the "ultimate health companion," in part because of the new heart monitor that can detect atrial fibrillation, and its electro-cardiogram function. (Only available for US users for now.) Its fall detection can alert emergency services if you fall and are immobile for more than a minute, making this a great tool for the elderly. Interestingly, Apple barely mentioned the fitness elements of the watch in the presentation of the new model, instead focusing on the design and health aspects. There is a new communication feature which is not specific to the Series 4 watch, but which is part of the new watchOS 5: Walkie-Talkie. When this is set up, you can speak to friends by pressing and holding the display as you would with an actually walkie-talkie. Unfortunately, this feature does not work reliably and I don't know anyone who even sees it as a useful feature; why not just make a call, either using cellular or Face Time? There are two models of the Apple Watch 4, one with GPS only and the other which also offers LTE cellular access. I've been using a cellular Apple Watch since the Series 3 - and bought a cellular Series 4 - and, while I don't make calls on my watch, it's useful to be able to use the device when I'm not near enough to my iPhone. 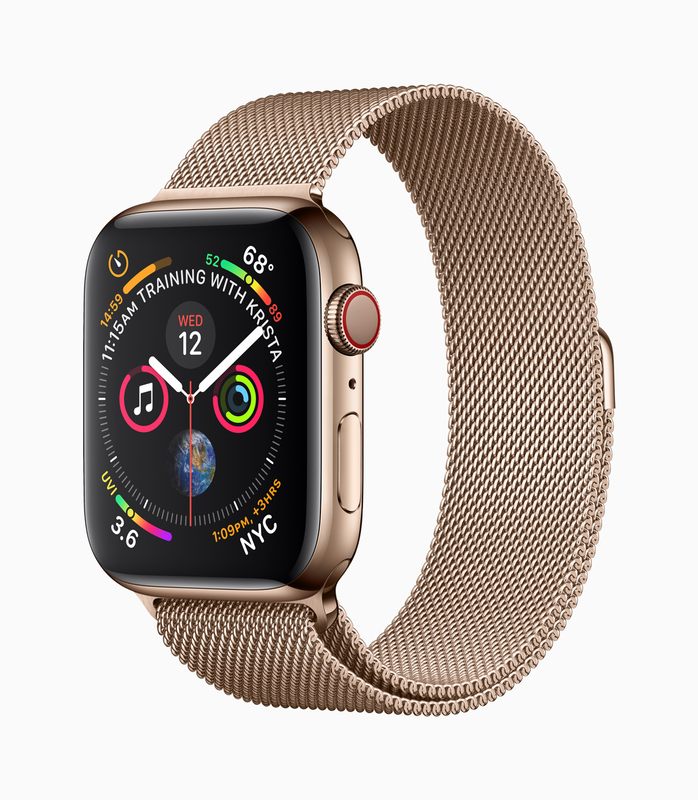 However, the extra cost for both the watch - it's a $100 premium - and the cellular contract make this more of a luxury than a necessity for most people. If you only use the watch to tell time, get and send messages, and track your exercise, you will probably find the Series 3 to be just fine; especially since Apple has dropped the price of that model substantially. For example, you can get the 42mm aluminum Series 3 GPS + Cellular for $409. Also, Apple has upped the price of its AppleCare+ warranty/insurance from $49 to $79, so the total cost, if you want that combination, is over $600 for the new model compared to $450 for last year's watch. If you're upgrading from one of the earliest models of the Apple Watch, you'll find the Series 4 to be a totally different device. With its better display, larger size, and much faster operation overall, you won't be disappointed. But if you have a Series 3 and don't use it much, you might want to wait another year. This entry was posted in Apple and tagged Apple, apple watch 4, iOS. Bookmark the permalink.